Welcome! Hello beautiful souls. So here I am creating my first blog. Today I would like to dedicate a post to the moon. Those of you who get to know me will soon see that i have a very strong relationship to grandmother moon. While I track her I dwell in her powerful round belly when she is full and surrender to her dark honest guidance when she wanes to dark moon. That's today. Happy new moon! In ancient times tribal women would retire to their red tents to menstruate and release at this time. This was the time of the moon that they could let go of all emotional negative energy they had been holding onto. Nice poetry. 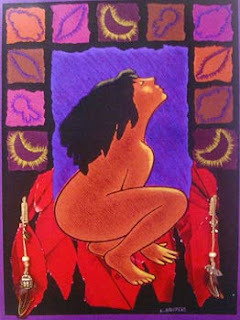 Even though, like many others, my moontime (menstruation) does not correspond so precisely to the moon i will use this universal energy to my advantage and let go of something myself. I find the easiest way to do this through ritual and tonight the act of burning seems significant.